This blog is now located at http://unofficialofficestuff.blogspot.com/. "Discover the only worldwide, performance-based certification program that validates the skills needed to get the most out of Microsoft Office and Windows Vista. Whether you want to stand out in the job market, improve your performance, or better prepare your students to enter the workforce, the Microsoft Business Certification (MBC) program can help you attain the valuable expertise you needâ€”and businesses rely onâ€”to succeed." Ed Bott has a discussion on Metadata. That information, such as names and notes, which is hidden in Word documents. Mauricio Duque has collected a list of 45 no cost design programs. "Some of them are pretty decent alternatives, not only for those who are not willing to spend the big bucks, but also for those who need some specific tasks done, like resizing a batch of picture without needing to run the almighty Photoshop." How a slide is laid out can be captured as a custom template. You are not restricted to the schems that come out of the box. 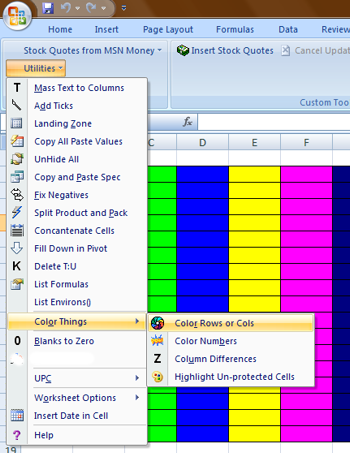 Excel Guru Ron de Bruin has put together the VBA code needed to send Excel via email. He has also included the sample workbooks for those that are not VBA literate. The add-in create a new tab on the Ribbon named RDBMail with a lot of mail options. You have the option to send as workbook or PDF for every mail option." Find out which provider a site is using. Find out which internet providers are most reliable. Find out which operating system is being used by which provider. Find out . . .
"MIStupid.com is The Online Knowledge Magazine that publishes information that everyone should know, wants to know, or forgot. MIStupid.com was created in 2001 by Greg Renza with the desire to eradicate the world's stupidity." Microsoft provides 22+ guides to productivity in the office. "Microsoft IT created Work Smart productivity guides (previously Everyday Productivity Education (EPE) guides) to bridge the gap between technology and users. Work Smart guides provide employees with scenario-based, best-use productivity aids on Microsoft products and technologies. As more Work Smart guides are published, Microsoft IT expects to see more consistent, productive, and cost-effective use of products and technologies across the company." Microsoft has a tutorial on how to create a database. 2007 came up with a number of new and impoved features. Most are the same in 2010. Here's a description of some built in tools. Often you will have pictures in one format and want to explore using it in a different manner. Built into Office 2003/7/10 is a mini app called Microsoft Office Picture Manager. You can use this before a show, or when you take a break. Have you ever been stymied by this PDF warning? You can enter data, but you can't save the file with the new information. "Fill and save PDF forms - Most other PDF viewers do not enable you to fill and save PDF forms without support from a premium product. Nuance PDF Reader provides frequently used annotation tools, letting you highlight, cross-out, and underline text." Some suggestions about how to empty your outbox and speed your greatest thoughts on their way. Nice post, i didn't know that. i hope you update your site regularly to re visit of your visitors. Here's a link to a PDF file that shows how to maximize Google searches. ". . . know what range is selected at any given time. You can look at the Name Box, but that only show the active cell." "We have heard a few of you have missed the ALT D shortcut to open an object in design. As you know, ALT in ribbon apps now allows you to access ribbon shortcuts. Next time you want to open an object in design view, try Control Enter." Applications put most of the most-used commands on the Home tab's Ribbon, not everything is there. You may want to add Close, Close All, or Print commands, for example. In the upper Left corner is the Quick Access Tool bar. Click the down-pointing arrow to the right of the QAT. Choose any common commands (New, Close, Print, etc.) by checking the option. Ed Bott discusses temp files; care, feeding, and cleaning. This site accepts your perfect prose and turns it around. PowerPoint can be one element, but there are other considerations when delivering information. 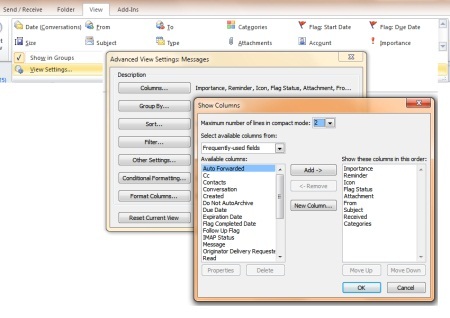 Outlook allows you to rearrange how information is displayed in your email list. "Footnote helps you find and share historic documents. We are able to bring you many never-before-seen historic documents through our unique partnerships with The National Archives, the Library of Congress and other institutions. Our patented digitization process is helping bring other collections to life on the web everyday. But Footnote is more than just a dusty, digital archive online. We provide you the tools to share your historical passions and connect with others." Here are some links the Access groups. Someone has probably asked your question before. When you merge data into Word, it takes on the formatting of the target document. This tip allows you the dictate the appearance of merged data. "PowerPoint Heaven is a PowerPoint entertainment portal for PowerPoint animations, games, artworks, showcases, animation templates and tutorials. The focus of this site is to maximize the use of Microsoft PowerPoint and go beyond its capability. Our goal is to show users that PowerPoint is not simply a presentation tool, but is also capable on leveraging into other areas such as creating games, artworks and animations."